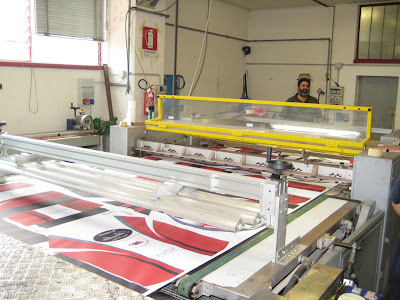 On Monday following the Gran Fondo, we took a road trip to a few factories. 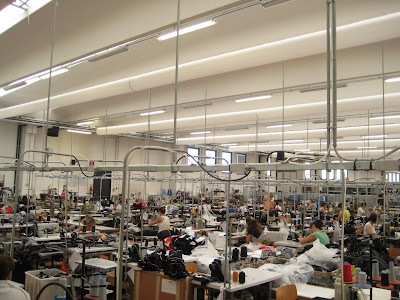 First we visited the Giordana factory to see how team kits are made. Here is the floor where all the stitching and finishing is done. These are the foam pads about to become chamoix. 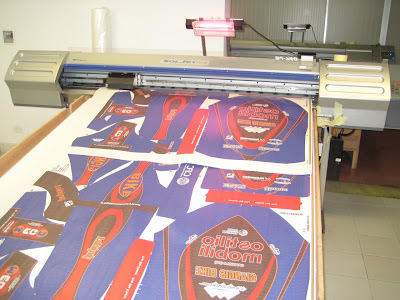 The pads are uniformly heated and then cut in a special oven. 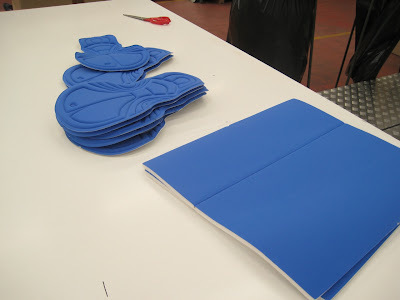 Many manufacturers use a hot plate to form the pads, which leaves tough edges and differing foam densities. Giordana's method creates a soft and even pad without seams. 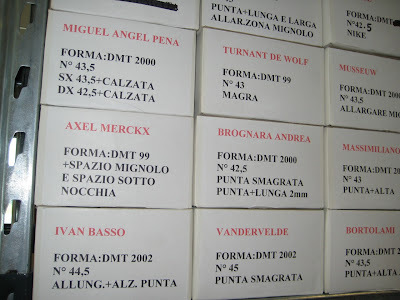 Fresh chamoix, hot off the press. 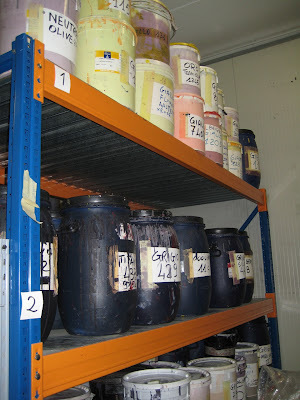 This ink will be mixed to create every possible color for team kit designs. 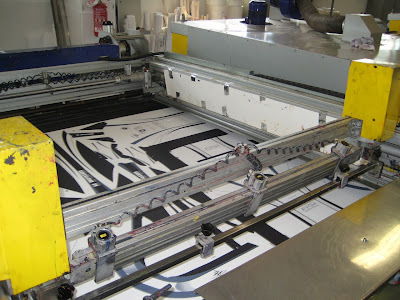 A kit design is printed on the giant ink jet, ready for transferring. 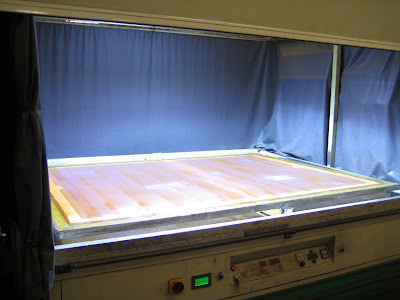 Screens are made for each color, and then the screens are used to layer one color at a time onto the jersey fabric. 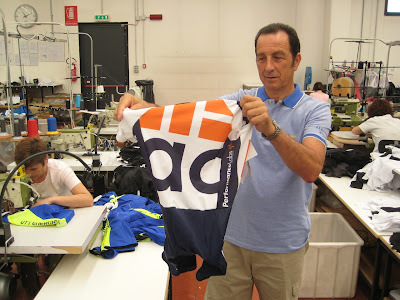 Giorgio holds up an almost completed AC skinsuit. For all of you who've asked when we're getting new kits in, the answer is: soon! 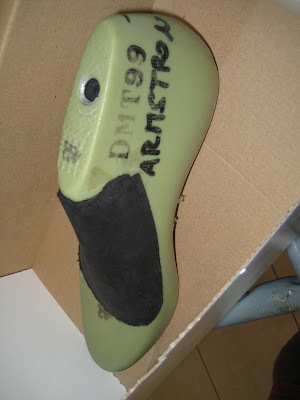 Next door to the Giordana factory is the DMT shoe factory. We saw the foot-lasts of some well-known athletes... Now that Mr. Armstrong has switched to jogging, these can probably get pitched. Part 3 will follow shortly!